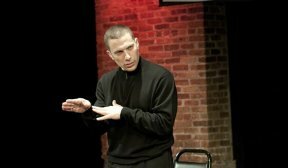 Puerto Rican prosecutor turned stand up comedian Elizardi Castro kicks off 2014 with a one month run of his popular one man show Law & DISorder beginning Feb. 1st through Feb. 28th at The Vittum Theater, 1012 N. Noble St. in Chicago. Showtimes are Fridays and Saturdays, 7:30 p.m.; Sunday, Feb. 16th at 3 p.m. Written, directed and performed by Castro’s and produced by Mike Oquendo, Law & DISorder reveals his journey from attorney to comedian. Castro’s shows have been recommended by numerous publications including the Chicago Sun-Times and the Orlando Sentinel and have been featured on WGN-TV, Telemundo and Univision. Tickets are $20 and can be purchased online at www.vittumtheater.org or by calling (773) 342-4141. All proceeds from the show will benefit the Ronald McDonald House Charities (RMHC®) HACER scholarship program. The local HACER program is part of the Ronald McDonald House Charities (RMHC) Scholarship Program and its main purpose, according to John DeCarrier, president of the McDonalds’s Hispanic Owner-Operators Association (MHOA) is to increase the number of scholarships at the local level to benefit our Hispanic students. The MHOA is conscious of the fact that college enrollment among Hispanics is at an unacceptable level and that many of them lack the necessary financial resources to follow their academic dreams. In answer to this need, MHOA awarded $30,000 in scholarships to 10 young Hispanics in 2013 and is committed to continuing that effort in 2014. The HACER scholarships help young Hispanics with financial needs who have demonstrated their academic and leadership abilities, as well as their sincere wish to serve their community. For more information about the HACER Scholarship, visit www.meencanta.com. © 7775 Chicago Hispanic Newspaper, Lawndale News, Hispanic Bilingual Newspapers, Su Noticiero Bilingue. All rights reserved. XHTML / CSS Valid.